The pattern is full of candies of different size, but you have control only of one red candy. 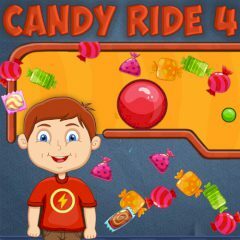 Move it from side to side and push other candies towards the kid. He loves sweets, so he expects to have all of them. Are you ready for exciting candy adventure? Every kid loves candies, but what about when the access to candies is limited? Lets help this kid and deliver all candies within the patter to him. Take control of one candy and move it from side to side, pushing other candies towards the exit. Don't miss a single candy and make sure the kid has them all!